Over the last week, I’ve been pondering ways to increase the readership of this blog. Today, as I stared into a grocery store’s magazine rack, the idea hit me. If established fitness periodicals can use this gimmick to boost circulation, so can I. Flex magazine put on its cover a young Arnold Schwarzenegger. I’ve often thought about why Arnold continues to inspire fitness enthusiasts nearly three decades after his retirement from professional bodybuilding. He hasn’t even appeared shirtless in a movie in any significant way since the early 1990’s. Arnold’s main appeal can’t be his size in his prime. Professional bodybuilders these days run thicker with better definition. Mr. Olympia 2006 stands 5’9” at 275 lbs, compared to Schwarzenegger’s championship reign at 6’1”, 245 lbs. Incidentally, this is no dig at Arnold. Today’s gym equipment is better, the science of fitness is more advanced, and the … umm … performance enhancers probably give you more bang for the buck. In my opinion, the continued fascination with Arnold results from the classic, sweeping artistry of his physique. Many of Arnold’s aesthetic gifts can, of course, be attributed to his good fortune with genetics. Take a look at his biceps. 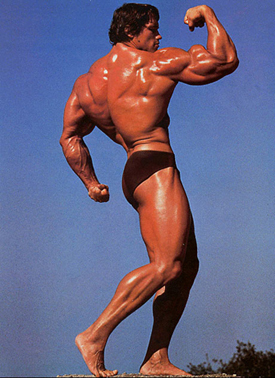 The typical bicep muscle terminates about an inch ahead of the forearm, while Arnold’s bicep fills the entire space between his front shoulder and elbow. The same principle applies to Arnold’s back. My lat muscle ties in around the middle of my rib cage. Arnold’s wings taper off virtually at his waist. But there’s a second factor at work: Arnold was a perfectionist when it came to proper lifting form. Beyond genes, Arnold’s long, graceful lines are the result of muscles worked in a controlled fashion through a full range of motion. His superior lifting technique lengthened his muscles and engaged the largest possible number of muscle fibers. Walk into a gym today, however, and you’ll find people performing all manner of abbreviated lifts: pull-ups that reach neither peak contraction at the top nor full extension at the bottom; overloaded squats that result in no serious bend in the knees; bicep preacher curls that stop a good 20 degrees short of straight arms. Excessive weight, laziness and all around bad habits have turned core lifts into a real live exercise in futility. What was true in Arnold’s day remains true today. Progress is not determined by how much weight you can move, but how much weight you can move with perfect form. This entry was posted on Wednesday, January 31st, 2007 at 9:29 am and is filed under Arms, Back. You can follow any responses to this entry through the RSS 2.0 feed. Both comments and pings are currently closed. i’ve added your blog to our fitness list. don’t be discouraged by people not commenting. as i understand it, most people don’t. it doesn’t mean you’re not a good writer with something valuable to say. work on getting links. Nice article. You are a good writer. However, have you seen the way Ronnie Coleman trains? He has the worst form I ever saw and yet he has won Mr Olympia eight times. Personally I don’t think modern bodybuilders look as good as Arnie did but you say “Professional bodybuilders these days run thicker with better definition.” and Ronnie Coleman is I am sure exactly what you are talking about. 5’11” 285lbs contest weight. Look up videos of him training on youtube. His form is terrible. I used to believe in perfect form too but seeing Coleman train changed my opinion completely. I sometimes use heavy weight with bad form and find my muscles aching painfully the next day. Of course the painful muscles lead to growth. Any thoughts? I checked out the Coleman videos as you suggested. There, just like you said: T-bar rows done standing ramrod straight, and some kind of bent over dumbbell row targeting neither lats nor rear delts. On the other hand, I had never seen before anyone do a perfect set of 10 bench presses with 200 lb dumbbells. And you have to admit, his knees did reach 90 degrees on his 2300 lb leg presses. Arnold wrote in his bodybuilding encyclopedia that some genetic freaks can bulk up by just walking past a dumbell rack. Coleman might be the most genetically gifted bodybuilder since Sergio Oliva – and be able to grow massively even with sloppy form. But just think of where he’d be if he did things right! I can imagine that bad form creates all kinds of aches and pains for you. It’s hard for me to say that this is “good” soreness, however, and not just muscles torn and twisted by improper technique. There’s probably something to be said for occasionally stressing your muscles with very heavy weight – a version of the Weider muscle confusion principle. And cheating to push your muscles to new gains is a part of every bodybuilder’s repertoire. But without Ronnie Coleman’s genes, I can’t see that strategy forming the core of a successful fitness program. Just looking up a pic of Arnold when I stumbled across your blogsite. Keep it up! Very interesting and good bits of advice! Cheers. I just wanted to interject and state that Arnold helped usher in the Cheat Curl as a lift. That greatly helped him develop the peaks in his biceps. Most people regard them as not a legitimate exercise, while even Arnold cheated during his curls to get that high rise in the muscle. Have somebody that leans too far fwd during lunges? Put the weight on the front, like the video below, and the person will have to pull their body upright to fight the weight. I find I’ve always gotten a better pump and better results with less effort using perfect form on every exercise. If I’m lifting too heavy, I risk hurtng my back once again and I get tired much quicker. useful to anyone who employess it, as well as yours truly :).